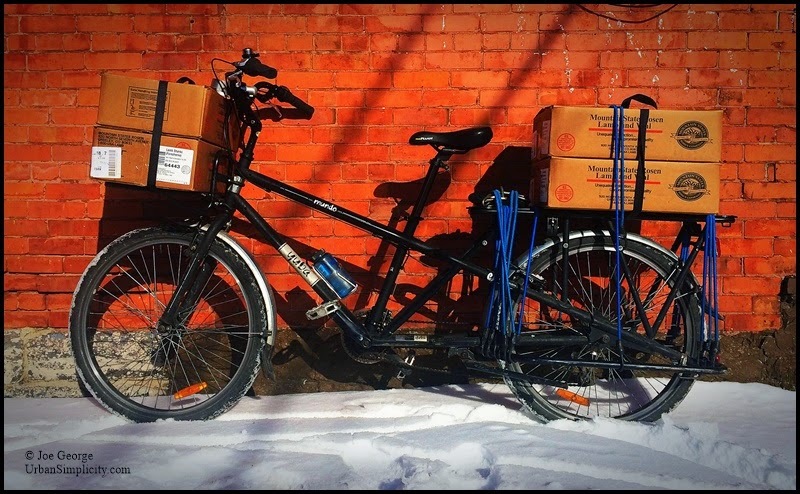 On the bike...Four boxes of food on their way to a local soup kitchen. So it pains me at times, it really does, to think of the amount of food that is discarded in America when there are so many people in need. And restaurants are some of the worst offenders of this. I didn't always think this way, but I do now. I have to. I--we--have no other choice. This type of thing is in our face--literally and figuratively--whether we like it or not. If we choose to ignore it or not it is still there. As a chef, when I have food left over from a party (or the accumulation of several parties), after offering it to employees (who are mostly low wage earners) I gather it up and carry it to a food pantry. I have to. In my heart I have no other choice. I am not perfect, of course--far from it--and on occasion things are discarded for a variety of reasons, but it hurts me. This is the least I can do. But it is still not enough. This said, my friend, writer, food aficionado, and concerned person, Lauren Newkirk Maynard, recently wrote an excellent but brief article in Block Club regarding this very subject, and mentioned yours truly in it. I'll get off my little soapbox now.